Ad River advertising network details. 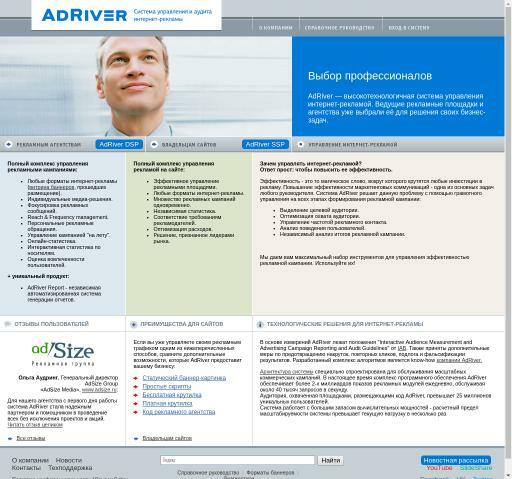 Founded in 2001, AdRiver has since become a leading ad serving format that provides publishers in the Russian market with advanced technological solutions. Using the platform, publishers will be provided with a full range of services for monitoring their ad campaigns including extensive targeting options, real-time tracking and reporting system, all banner formats and a personal approach to implementation. AdRiver covers several Geos including Russia, Belarus, Ukraine, Kazakhstan, Azerbaijan, Georgia, Moldova, Uzbekistan, Armenia with a specific cost of use depending on the country. Create an account on AdRiver today and get ready to earn more benefits with the network! You can check AdRiver reviews on Affbank and ask AdRiver Team any question by using the contacts above, especially about how to earn money!